As a new homeowner, I’ve incurred lots of fun new costs. Deck stain and grout and driveway maintenance are all on my list of exciting things I spend money on. Now that I have a few more bills than I did as a renter, an idea that really resonates with me is the concept of “voting with your dollar”. We work hard for our cash, and I believe it’s worth considering who and what you are supporting when you spent that money. I know this is idealistic and not always attainable, as it’s often even more expensive to support quality retailers. That means that the wages their employees earn are enough to actually live in the city in which they work. So, if this is something that is meaningful to you I would recommend seeing if your city has a list of the local businesses that are Living Wage Certified. Often businesses will advertize themselves this way because it is a big deal. Some of my favorite spots that are living wage in Asheville: Asheville Yoga Center, Burial Beer, Desoto Lounge, Mamacitas, Patton Avenue Pet Co, The Wedge, and White Duck to name a few! Another way to look at businesses is their practices. As a bit of a product junkie, I’ve been researching more “natural” and safe makeup. I was pretty pumped to find out that one of my favorite brands Tarte, is free of parabens and phthalates and they don’t practice animal testing! (Read more here.) I mentioned this to Heather not long ago, and she gave me a gift certificate for Valentine’s Day! That one is a stellar gift giver, let me tell ya. Here’s what I added to my non-toxic beauty stash! If you’re local and interested, check out the list of living wage certified spots, and if your favorite one isn’t on there, maybe you should let them know about it! And, if you have other ways you like to support quality businesses, please let me know! Next Post Recapping the Weekend…Even Though it’s Tuesday! 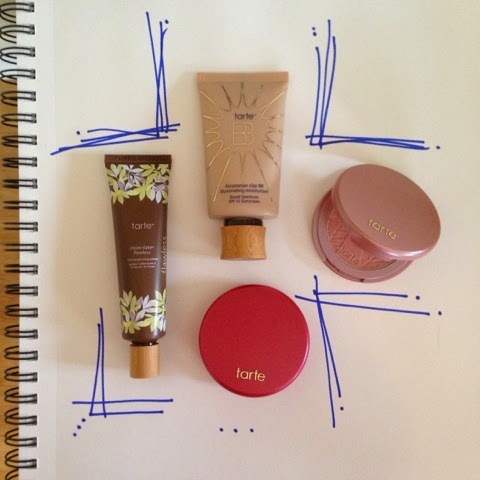 I just got Tarte blush in my popsugar must have box! This is an awesome post Anna! I am going to find out about living wage certified areas in Philly we can support as this is important to us as well. I just got a tarte QVC tsv and it includes some of the most highly pigmented eye shadow ever. Amazing. It also came w/ the "foundcealer" marajuca foundation and brush and I am impressed. LOVE tarte!